Like most companies, the NFL enforces a strict uniform policy. Going against what the league states is appropriate to wear during games or interviews will not be tolerated. Players who do not adhere to these rules will be penalized, normally in the form of fines. The NFL increased the fines for violating the league’s uniform policy this offseason. Now fines start at $50,000 for a first time offender and can go up to $100,000. Prior to this change, the cost for a first time offense was $5,250. The $100,000 fine has only been given out one time. Brain Urlacher received this once. It can only be given out when someone wears unauthorized clothing or gear during an interview prior to the Super Bowl or during the Super Bowl itself. Urlacher was given it because he was caught doing an interview prior to the Bears’ Super Bowl matchup against the Indianapolis Colts. He was wearing a hat that had the logo of a sports drink company that was not an official sponsor of the NFL. The NFL has a number of reasons to implement a uniform policy. First, it makes it easy on officials if players from the same team all are dressed alike. Secondly, the NFL wants to protect its sponsors from players wearing the logos and merchandize of their sponsors' competitors. This could potentially cause the NFL to lose the sponsorship of a certain company. Finally, there are safety concerns. Football is a very physical sport and much of the uniform is worn to decrease a player’s likelihood of injury. Over the past ten years, the NFL has given out many fines for uniform violations. A couple of these have some great stories behind them. This list ranks the fines in order of least to most expensive. The violations must have been committed on game day. Interviews conducted during the week are not counted. therefore, Urlacher's $100,000 is not going to be listed. Since there have been a number of fines given to first time violators and most players do not repeat the offense, the first timers need to have a great story behind their violation in order to make the list. Every one remembers this one. The date was October 26, 2006. In what he claimed was in honor of Hispanic Heritage Month, Chad Johnson taped a new name on the back of his jersey. 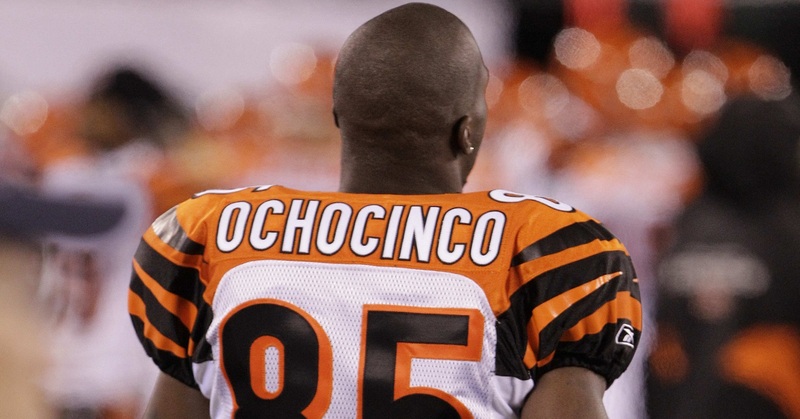 That name was “Ocho Cinco” which is Spanish for the numbers eight and five. Johnson wore number 85 throughout his career. Prior to the start of the game, Bengals’ quarterback Carson Palmer was caught on tape ripping Johnson’s new name tag off his jersey to reveal is usual “C. Johnson”. The NFL fined Johnson $5,000 for the incident. Though this is not one of the heaviest fines placed by the NFL, it was the standard amount for a first time violation at the time. It makes the list because it is a very memorable event and inspired him to legally change his last name. If nothing else, the money spent on the legal fee required to have the NFL actually allow the new Chad Ochocinco cost enough to put him here. One major story from last season was Brandon Marshall’s shoes. In a week six matchup against the New York Giants, the Bears’ wide receiver decided to wear green cleats instead of the acceptable Bears’ team colors. He did this in honor of National Mental Health Awareness Month. Marshall has suffered from bipolar disorder for his entire life. You could definitely see evidence of these types of problems in the early stages of his career. His issues have since been corrected due to seeking medical attention for the disorder. Marshall knew before going into the game the NFL would fine him for his shoes. He promised to donate the same amount of the fine to charity. That next week a lucky unnamed charity received a check signed by Marshall for $5,250. Patriots’ linebacker Brandon Spikes was fined $7,875 for wearing red cleats during a game against the Cincinnati Bengals. Players are allowed to wear cleats that align with their team’s colors. Those colors are specified at the beginning of the season by the team and approved by the league. The Patriots designated blue and white to be their acceptable colors for players’ cleats. This incident happened during Breast Cancer Awareness Month, when the NFL allows players to wear pink shoes. Spikes was just a bit off. The curious thing about this is the amount of the fine. This was his first time violating the league’s uniform policy. Therefore, he should have only been fined $5,250. Seattle Seahawks’ running back Marshawn Lynch committed the same violation the week before this and received the league’s normal fine. How was Spikes’ situation any different? The NFL works very hard to protect their sponsors. The major sporting apparel sponsor of the NFL is Nike. Wearing anything other than Nike will result in heavy fines. Cam Newton found this out the hard way. During his rookie season, Newton signed a contract to endorse Under Armour. The company pays the Panthers’ quarterback $1 million every year for his endorsement. Newton was caught wearing Under Armour facemask clips during a game. Facemask clips are the clips that keep a visor on the player’s helmet. For sporting the wrong company during a game, the NFL fined Newton $10,000. The 2012 season was also an expensive one for the 49ers’ safety Dashon Goldson. Throughout the course of the season, Goldson racked up over $70,000 in league fines. Two of those fines came from uniform violations. Both were given because of problems with his pants. In total, those violations cost him $15,750. The rest of his $70,000 in fines came from illegal hits and misconduct violations. It should not be a surprise that Chad Johnson or Ochocinco would appear on this list more than once. Ochocinco was fine $20,000 the same week Bart Scott was fined $20,000 for the chin straps. Oncocinco’s violation was much more memorable. He received his fine because he decided to wear gold cleats during his matchup against the Pittsburgh Steelers. Not only was this not his first offense, but this violation came one week after the league fined him $25,000 for violating the NFL's social media policy. It may not be as good of a story as the antics of Chad Ochocinco, but to be historically accurate, Clinton Portis’ $20,000 fine has to be a step higher on the list. 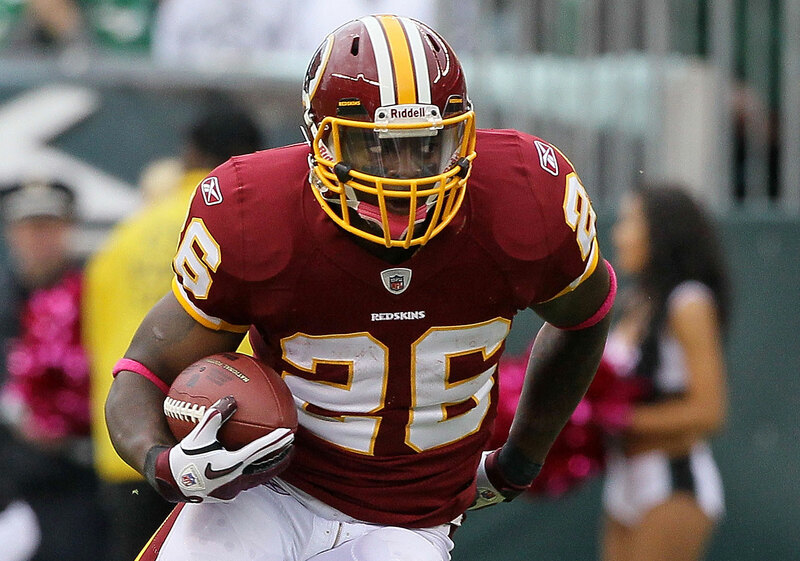 While Portis was with the Washington Redskins, he received a uniform violation fine for wearing unauthorized socks, an eye shield, and black shoes. The league considered these as three separate violations. His $20,000 fine was the highest any player has received for uniform violations at that time. Following the imprisonment of quarterback Michael Vick, a few of his Atlanta Falcons teammates wanted to show some support for him. During the game, DeAngelo Hall and Chris Houston taped a poster of Vick on the back of the Falcons’ team bench. Hall and tight end Alge Crumpler were caught on camera wear “MV-7” painted on their eye black. Joe Horn was caught on camera helping Crumpler show off his shirt that said “Free Mike Vick” and proceeded to do his post game interviews in it. All together the players were fined a grand total of $47,500 for their antics. Hall, White, Houston, and Crumpler were each fined $10,000 a piece. Joe Horn only received a $7,500 fine because he was not actually displaying anything himself.